Astronauts aboard the International Space Station captured this oblique view of the snow covered peaks of the volcanoes on Russia's Kamchatka Peninsula, home to many active volcanoes. The 240-mile (390-kilometer) perch of the International Space Station gives the astronauts aboard a unique perspective on Earth's most stunning features. 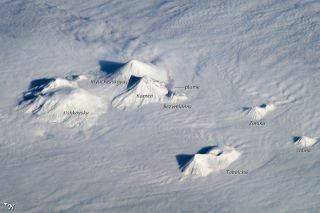 In a photo taken on Nov. 3, an ISS crew member snapped an image of snow-covered volcanoes of Russia's Kamchatka Peninsula. At the time the picture was taken, low-lying clouds cover the surrounding lower terrain, and interaction of the volcanoes with air currents created rippled cloud patterns, NASA's Earth Observatory reported. Also visible in the image is a plume of ash and steam emanating from Bezymianny volcano. The volcanoes of the Kamchatka Peninsula are typically fairly active; they lie along the Pacific Ring of Fire, home to 75 percent of the world's active and dormant volcanoes. Bezymianny, with a summit height of 9,455 feet (2,882 meters) above sea level, is dwarfed by nearby Kamen at 15,042 feet (4,585 meters) above sea level and Klyuchevskaya at 15,862 feet (4,835 meters). The height of the volcanoes along with the low viewing angle of the ISS shows the shadows of the peaks on the surrounding clouds and gives the photo the appearance of a topographic map.